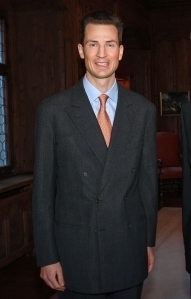 Alois Philipp Maria, Hereditary Prince of Liechtenstein, Count Rietberg (born 11 June 1968), is the eldest son of Hans Adam II, Prince of Liechtenstein, and Countess Marie Aglaë Kinsky of Wchinitz and Tettau. Alois has been regent of Liechtenstein (Stellvertreter des Fürsten) since 15 August 2004. He is married to Duchess Sophie of Bavaria. ↑ "Hereditary Prince Alois". Fuerstenhaus.li. Retrieved 2012-11-29. This page was last changed on 22 June 2014, at 23:58.